The VIPER is the perfect solution for those looking to enjoy multiple HD video streams, fast file transfers, and lag-free gaming. The DSL-2900AL VIPER Dual Band AC1900 Modem Router lets you easily connect, control, and monitor a network using the future of Wi-Fi technology, today. It combines an ADSL modem and high-end Wi-Fi router together to create a single, easy to use device that creates and shares an Internet connection for all your devices. 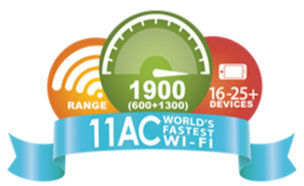 Advanced AC SmartBeam technology provides a significant increase in Wi-Fi performance, while Advanced Quality of Service (QoS) efficiently distributes bandwidth. 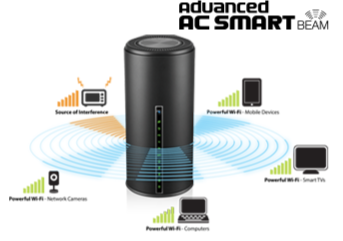 Advanced AC SmartBeam technology brings you the future of high-bandwidth Wi-Fi connectivity, vastly increasing the speed and coverage of your network. This allows you to stream HD video, make Internet calls, provide lag-free online gaming and surf the Internet from every corner of your home without interruption. The high-power internal antennas send the signal into the furthest corners of your home, giving you a strong connection wherever you are. Today's households are connecting more devices to the Internet than ever before with more and more iPhones, Androids, tablets, and laptops laying around in any given home, it's important that each device gets the speed and coverage it deserves. Delivering Wi-Fi AC1900 dual band speeds with Advanced AC SmartBeam technology to your home network, the DSL-2900AL is the perfect solution for those looking to enjoy multiple HD video streams, fast file transfers, and lag-free gaming/video chatting - all with less wireless interference for maximum throughput. The mydlink service offers you a simple and easy solution to access your mydlink enabled router from anywhere around the world via the Internet. The mydlink service gives you a single place to view what's happening at home in an instant while you're away. Monitor and control your home network remotely while on the go. Simply log into your account via mydlnk.com or download the mydlink enabled apps.